The editors of Soldier Studies are honored to present, over the next 10 months, a series of articles written by some of the leading historians and authors on the American Civil War. The focus of this series are the soldiers themselves. Though they suffered great hardships, endured battle and fatigue, through it all they left behind for posterity a wealth of correspondences and reflections that have helped historians reconstruct what it was like to have been a soldier in the American Civil War. It is our hope that this series makes a respectable contribution to the study of soldiers and their experiences. - Chris Wehner, Curator & Founder, SoldierStudies.org. Aaron Sheehan-Dean is an associate professor of history at the University of North Florida. He is the author of Why Confederates Fought: Family and Nation in Civil War Virginia and the Concise Historical Atlas of the U.S. Civil War and the editor of The View From the Ground: Experiences of Civil War Soldiers and Struggle for a Vast Future: The American Civil War. S.H.M. Byers was a member of the 5th Iowa Volunteer Infantry Regiment and wrote several articles about his experiences after the war. Byers' insights and descriptions of combat are visceral and poignant, and honest and straightforward. This selection is perhaps one of the best contributions from a soldier of the great conflict concerning what soldiers felt, didn't feel, and how they survived the mental and physical horrors of battle. Mark H. Dunkelman is the author of Brothers One and All: Esprit de Corps in a Civil War Regiment and other books on the 154th New York. An artist, writer, and musician as well, he lives in Providence, Rhode Island. Lance Herdegen is the former director of the Institute of Civil War Studies at Carroll University, Lance Herdegen was an award winning journalist. 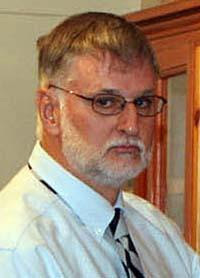 He is currently a historical consultant for the Civil War Museum of the Upper Middle West. He is the author of numerous articles and books, among them, Four Years with the Iron Brigade: The Civil War Journal of William Ray and most recently Those Damned Black Hats: The Iron Brigade in the Gettysburg Campaign. He took time from his busy schedule to e-chat about his latest book, Those Damned Blackhats! The Iron Brigade in the Gettysburg Campaign, published by Savas Beatie, LLC. - Chris Wehner is author of 11th Wisconsin in the Civil War: A Regimental History, published by McFarland & Co. and he teaches classes online at the (i) History Network. Gettysburg Battlewalks: Herbst Woods, Scott Hartwig, Pennsylvania Cable Network, DVD format, 2 hours 25 minutes, 2006, $19.95. Herbst’s Woods, popularly but inaccurately known as McPherson’s Woods, are a part of the 160 acre John Herbst farm. The northern boundary of the woods is also the southern boundary of the McPherson farm and the McPherson buildings are closer than the Herbst buildings. The western boundary of the woods is Willoughby Creek and the eastern boundary is the crest of McPherson Ridge. The wood lot during the battle consisted of about 18 acres of trees but no underbrush. Visibility in the woods was about 100 yards. Farm animals grazed through the woods and kept it clear of most vegetation and low hanging branches. The woods contained heavy fighting between the Federal Iron Brigade and the Confederate brigades of Archer, and elements of Brockenbrough’s and Pettigrew’s brigades. It also contains the location of the death of Federal Corps commander Reynolds. The 26th North Carolina and 151st Pennsylvania fought each other here. Scott Hartwig's GNMP Anniversary Battlewalk 2006 was attended by about 300, including CWL who leaves his physical graffitti on many minutes of the film. As on that day, CWL viewed the DVD with McElfresh's watercolor map in his hands. Based on Cope's map, McElfresh's maps have the tree and fence lines, the farm buildings and crops clearly marked. The elevation lines are simple and shown by green hash marks. Among Hartwig's many fine tours, the 2006 Herbst Woods tour ranks very high in clarity of both units' arrivals and movements on the field and human interest details of the soldiers. The Harmom Farm woods and wheatfiels , through which the Confederate assault came is now (or was until January 2009) the Gettysburg Country Club. 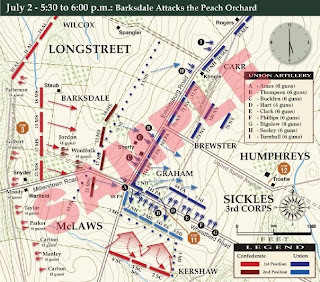 Archer's, Brockenbrough's, Pettigrew's and Fry's assaults upon the Iron Brigade and the 151st Pennsylvania of the Biddle's brigade. The 26th North Carolina and the 151st Pennyslvania met in the east section of Herbst's Woods; that fact was the basis for a 2008 Gettysburg Licenced Battlefield Guide Exam question. Hartwig covers numerous accounts of verbal command orders, flag losses, color gaurd losses in the words of the soldiers themselves. He sets forth both the command and control issues of the engagement in Herbst's Woods as well as the testing of individuals' courage. It was a fine 2006 battle anniversary morning and it made a fine PCN Battlewalk dvd. The Complete Gettysburg Guide book has a Facebook page. Here's a map posted there. Looks clear and sharp. CWL likes: the clock in the upper right hand corner, the 1863 fence lines, wood lines, and farm buildings. The scale is marked in 500 and 1000 feet and that's a nice feature to use at home. Quibble: the Wentz house is not show but it is in the middle of the 2nd New Hampshire's line, showing and labeling the house might clutter the map; but on the other hand the Staub house is shown and it is usually left off most other books' maps. There are 70 maps like in The Complete Gettysburg Guide. When taking anniversary tours of the battlefield with NPS rangers CWL 's cargo pants' pockets carry the Friend's Maps, McElfresh Watercolor Maps and the Trailhead map. Hopefully The Complete Gettysburg Guide will fit in the wide side pockets, because it looks like it will be travelling on the battlefield with me. 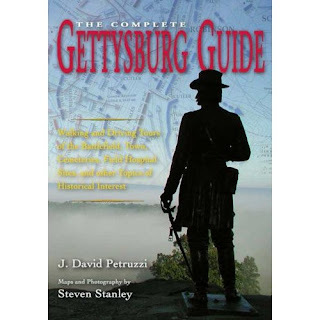 The Complete Gettysburg Guide: Walking And Driving Tours of the Battlefield, Town, Cemeteries, Field Hospital Sites, and other Topics of Historical Interest by J. David Petruzzi and Steven Stanley, Savas Beatie Publishing, 320 pages, 70 maps, photographs, index, bibliography, $39.95. The Complete Gettysburg Guide is the first and only of its kind - this scholarly full-color book contains complete walking and driving tours of the June 26 skirmishes, the entire battlefield (much more than the park's auto tour provides), East Cavalry Field, the battles of Hunterstown and Fairfield, the National Cemetery and Evergreen Cemetery, the field hospital sites, and even a special tour of all the known rock carvings on the battlefield. Written by noted Gettysburg scholar J. David Petruzzi, the book features the beautiful photography and maps of Steven Stanley, widely acclaimed for his cartographic work for the Civil War Preservation Trust and "America's Civil War" magazine. Even GPS coordinates for many outlying stops and spots are included, making this guide the easiest to use. CWL: A copy is on pre-order at Amazon.com and CWL will immediately open the box when it comes. Though CWL winces at any media with the words 'Complete' or 'Definitive' in the titles, it is likely that this book will be the best of its kind to date and will probably be essential to those aspiring to take the Gettysburg licensed battlefield guide exam. Hohmann’s resignation stems from a Feb. 26 newspaper letter to the editor, and subsequent letters to two federal Pennsylvania officials, in which he called for oversight of Gettysburg National Military Park Supt. Dr. John Latschar. The letters, signed by Hohmann, cite “possible ethics violations” by Latschar. Hohmann signed the letters using his title of president, upsetting other guides. Reportedly, some guides threatened to leave the organization if Hohmann didn’t step down, which would have resulted in a loss of membership dues. According to Hohmann, proceeds from a book — written by former ALBG President Frederick Hawthorne — may have also been pulled if he didn’t resign. The proceeds generate about $5,000 annually, representing the group’s largest source of income. Hawthorne did not immediately return a call Sunday seeking comment. “I’m not going to be blackmailed,” said Hohmann, adding that he didn’t leave the association. He did, however, resign as president. “I don’t quit,” Hohmann says. Association member Roy Frampton is replacing Hohmann as president. The group will appoint a vice president at its executive board meeting in April. “That’s the way our bylaws work,” says ALBG Treasurer Phil Lechak. “(Frampton) was our vice president, so he automatically becomes the new president.” Even though he represented the group as president, the views expressed in Hohmann’s letters did not please other guides. Hohmann asked Congress to explore possible “abuses” and “malfeasance” related to Latschar’s role in creating the new $103 million Battlefield Visitor Center. The U.S. Inspector General (IG) is reviewing the issue, as well as many other allegations. His letters were written when the IG investigation became public. Hohmann also wrote letters to two federal officials, U.S. Rep. Todd Platts and U.S. Sen. Bob Casey, seeking congressional hearings. Hohmann and Latschar have clashed over the years on matters such as a new tour reservation system, park rules and regulations, and Latschar’s wife taking notes at association meetings. Hohmann led the group during a period of growth and change. In Jan. 2008, the membership voted to vacate its headquarters at the old park visitor center on Taneytown Road, after voicing displeasure about the park’s new scheduling system. The group branched out to sub-locations, and now has an office at Patriots Point along Steinwehr Avenue. National Park Service May Buy Country Club, Scot Andrew Pitzer, Gettysburg Times, Friday, March 20, 2009. The National Park Service is interested in purchasing the 60-year-old Gettysburg Country Club. According to Gettysburg National Military Park spokeswoman Katie Lawhon, talks are ongoing between the park and the club’s owner, Susquehanna Bank. The club closed in 2008 because of financial difficulties. “We have been in touch with the new owners,” Lawhon said this week. “We’ve been in negotiations with other owners for years, but could never come to a successful agreement. Now, it’s beginning again with the new owners.” The 120-acre property along the 700 block of Chambersburg Road is listed as a “high priority” in the park’s land protection plan of 1993. It sits within the boundaries of the 6,000 acre park. “Essentially, we would buy the rights to subdivide the property,” Lawhon said. When asked what the park would do with the land, Lawhon replied that the purpose of obtaining the property would be to save it from future development. “It’s developed, but it’s not like there are 120 houses,” she said. The Park Service would likely maintain the property as open recreational space. Also, vegetation may be cleared to enhance the area’s historic viewshed. The club sits on the site of the historic Abraham Spangler and Harmon farms, according to the park. Confederate soldiers advanced and retreated over the farmland during the Battle of Gettysburg, July 1, 1863. Now, the property includes a nine-hole golf course, tennis courts, a swimming pool, other recreational areas, and a clubhouse. “All of that could stay, and continue to be used for recreational use,” Lawhon said. For the first time since 2001, the federal government is allocating funds to GNMP for land acquisition purposes. The park is slated to receive $2.2 million in 2009. Some of those funds could potentially be used to acquire the country club. “It’s a very long process for the Park Service to acquire the land,” Lawhon noted. There is no word on the property’s potential selling price, but there are a few signs. During a sheriff’s sale in January, the “upset” bid for the club was announced at $2.79 million, meaning that the bank would not sell it for less than that amount. No bids were submitted, so the property went back to Susquehanna Bank, the financial agency that foreclosed on the property last year. “Banks are not generally in the business of running country clubs,” bank attorney Eugene Pepinsky said previously. 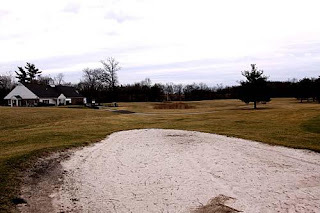 Gettysburg Country Club, 730 Chambersburg Road, had been open since 1948 but found itself in dire straits in 2008 when club officials said its financial situation had “never been more serious.” The club racked up more than $3.6 million in debt over the past several years to various groups. It owed $2.9 million in mortgage for a new clubhouse and tennis courts, and the club owed money to at least 16 different organizations. The new building has a 70-seat conference room; a pub that can hold 60 people; and a ballroom with a capacity of 250. Following a costly development project in 2006-07, the club’s financial problems forced it to close in May 2008. 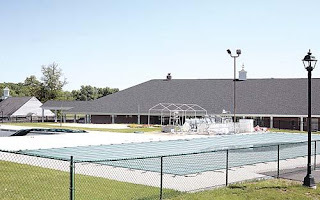 Club members paid to reopen the pool in June 2008, and the county sheriff seized the land in Sept. 2008. 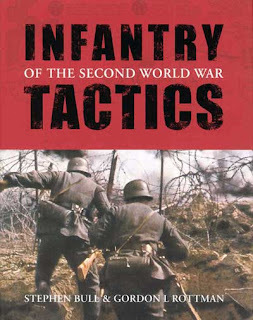 Infantry Tactics of the Second World War, Stephen Bull, Gordon L. Rottman, Osprey Publishing, photographs, maps, illustrations, diagrams, index, bibliography 224 pages, 2008, $24.95. When CWL is not reading in the American Civil War, then World War II and modern wars are a substitute. A common thread among each of the wars is house to house fighting. Recently CWL has posted on Fallujah and Saigon and is looking at accounts of street fighting in the American Civil War. With an query regarding house-to-house and street-to-street fighting to online discussion group, an appetite grew for a greater familiarity with World War I and World War II infantry tactics. I managed to find a great deal on a new book from Osprey Publishers. Heavily illustrated with drawing, photographs and maps, Infantry Tactics of the Second World War covers squad and platoon, company and battalion, and anti-tank tactics of the European and Pacific Theatres. Diagrams of weapons, watercolors of street fighting highlight the chapters. I'll be looking for a companion volume on World War I. For upcoming reading on Leningrad, Moscow, Sicily and the Italian peninsula CWL will keep Infantry Tactics of the Second World War close by. Joseph T. Glatthaar. General Lee's Army: From Victory to Collapse, New York Free Press, 41 illustrations, 19 maps, notes, bibliography,index, 600 pp., 2008, $35.00. Carolinas Campaigns and Partners in Command: Relationships between Civil War Leaders Glatthaar in General Lee's Army extensively relies on the voice of the soldiers found in primary documents and the quantitative research that is sometimes more hidden within the primary sources. The world of individuals, the world of ideas and the world of quartermasters are brought together in a way that is reminiscent of Bell I. Wiley who relied on the primary source but did not rely on the numbers like Glatthar. He repudiates Lost Cause historiography that preaches that neither Lee nor his army had faults. Loyalty and courage, desertion and cowardice have a place in the narrative. Glathaar created a database of 600 soldiers and tested it for the number of killed, wounded, and lost to disease; at the end of the war only 25% of the soldiers were untouched. Their median age was 24 in 1861 and they in a slightly higher portion from the well-to-do. In the course of the war, 14% of the Army of Northern Virginia deserted at one time or another. Glatthaar work shows that it was not necessarily a rich man's war and a poor man's fight. CWL notes that Glatthaar has come to understand that every social class supported slavery as the cornerstone of the Confederacy. Close to 50% of the 1861 Rebel army lived in households that used slaves. Like McPherson, Glatthaar sees the community, the government, the hearth, manhood, and hatred of the enemy as motives for joining the military. Glatthaar offers an evenhanded discussion of desertion. The book is driven by chronology but Glatthaar is a subtle writer and themes of are woven throughout. Food, arms, post-traumatic stress, the lack of health care and substantive nutrition. Glatthaar's quantitative research is an important element in the narrative but it never becomes tedious. It is not hard to imagine that General Lee's Army has set a new standard for writing Civil War armies' history. Readable, enjoyable, bring new insights to the story, General Lee's Army is not a battle history but a social history of men who passed through the experience of being a Civil War soldier. 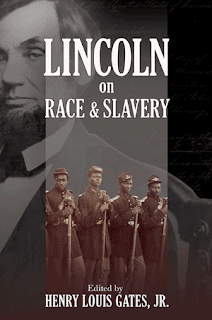 Of All The New Lincoln Books . . . .
Bruce Trinque of Amston, CT feels this way about Lincoln on Race and Slavery , Henry Louis Gates Jr. (Editor, Introduction), Donald Yacovone (Editor), Princeton University Press, 408 pp., 2009, $24.95. "In this bicentennial year of Abraham Lincoln's birth, there has been a flood of new books about him. I suspect that Henry Gates's "Lincoln on Race & Slavery" may turn out to be the one volume among that pile which will prove the most important in understanding the most important American figure of the mid-Nineteenth century and his relationship of the most important question of mid-Nineteenth century America. Gates's approach is dramatically straight-forward. He presents, in chronological order, all of Lincoln's major public and private declarations (speeches, letters, etc., dating from the 1830s until a few days before his death in 1865) upon the separate but related threads of slavery, race, and black colonization (the movement aimed at relocating blacks to colonies in Africa or Latin America to avoid the inevitable complications and frictions arising from free blacks and whites living side by side in America). Gates introduces each statement with a lucid explanation of the context for Lincoln's words. Harvard President Wins $50,000 Book Prize, Associated Press, March 10, 2009. Historian and Harvard University president Drew Gilpin Faust has won a $50,000 prize from the New York Historical Society for This Republic of Suffering: Death and the American Civil War. Faust, 61, received the fourth annual American History Book Prize, the society announced Tuesday. She has written several other books about the Civil War and the South, including "Mothers of Invention" and "A Sacred Circle." Previous winners include Doris Kearns Goodwin and David Nasaw. Hidden Message Found in Lincoln Pocket Watch, Neely Tucker,Washington Post, March 10, 2009. For more than 150 years, Abraham Lincoln's pocket watch has been rumored to carry a secret message, supposedly written by an Irish immigrant and watchmaker named Jonathan Dillon. Dillon, working in a D.C. watch repair shop in 1861, told family members that he -- by incredible happenstance -- had been repairing Lincoln's watch when news came that Fort Sumter had been attacked in South Carolina. It was the opening salvo of what became the Civil War. Dillon told his children (and, half a century later, a reporter for the New York Times) that he opened the watch's inner workings and scrawled his name, the date and a message for the ages: "The first gun is fired. Slavery is dead. Thank God we have a President who at least will try." He then closed it up and sent it back to the White House. Lincoln never knew of the message. Dillon died in 1907. 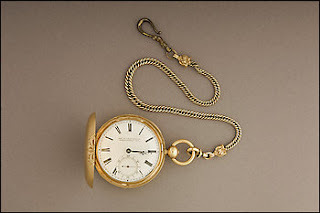 The watch, meanwhile, was handed down and eventually given to the Smithsonian Institution in 1958. It didn't run anymore. No one had pried open the inner workings in ages. The old watchmaker's tale was just that. And then Douglas Stiles, Dillon's great-great grandson, alerted Smithsonian officials to the family legend last month. He was a real-estate attorney in Waukegan, Ill., he explained. He'd heard the legend around the dinner table as a kid, but had just discovered a New York Times article from 1906, quoting Dillon as telling the story himself. This morning, in a small conference room on the first floor of Smithsonian's National Museum of American History, officials decided to find out. Expert watchmaker George Thomas used a series of delicate instruments -- tweezers, tiny pliers -- to pull apart Lincoln's timepiece. He put on a visor with a magnifying lens and talked as he worked. Some of the pins were nearly stuck, he explained. The hands of the watch were original with a case made in America and the workings from Liverpool. The Illinois rail-splitter had splurged: The watch, Thomas said, would be the equivalent to a timepiece costing "$5,000 or more" today. And then he pried off the watch's face, pulled off the hands, and turned it over to see the brass underside of the movement. The audience, watching on a monitor, gasped. Split into three different sections to get around the tiny gears, was this razor-thin etching: "Jonathon Dillon April 13, 1861. Fort Sumter was attacked by the rebels on the above date. Thank God we have a government." The old man's memory had not been exact. He had not forecast the end of slavery, or Lincoln's critical role in its demise. But it was there, a little bit of history that had been resting on Lincoln's hip, unseen during those tumultuous days of war and rebellion, the Emancipation Proclamation and the rest, and then resting, unseen, for more than a century and a half. Stiles was delighted. "That's Lincoln's watch," he said after putting it down, "and my ancestor wrote graffiti on it!" 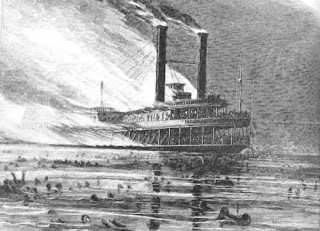 On an April night in 1865, the steamship Sultana slowly moved up Mississippi River, its overtaxed engines straining under the weight of a human cargo that included an estimated twenty-four hundred passengers which was more than six times the number it was designed to carry. Most were weak, emaciated Union soldiers, recently paroled from Confederate prison camps, on their way home after enduring the violence of war. At two a.m., three of Sultana's four boilers exploded. Within twenty minutes, it went down in fire and water, taking an estimated seventeen hundred lives. 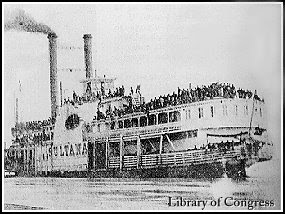 The sinking of the Sultana remains the worst maritime disaster in American history, yet due to a confluence of contemporary events (Lincoln had recently been assassinated and the war had ended), it soon faded into relative obscurity. Alan Huffman presents this harrowing story against the backdrop of the endless suffering already endured by its survivors. Using contemporary research as well as digging deep into archives and family keepsakes, Huffman paints a gripping portrait of the young men who made it home alive. 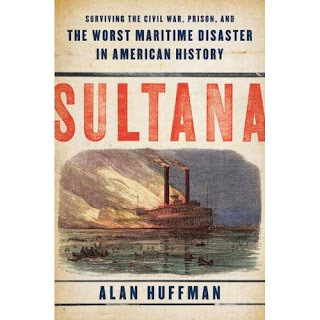 A stunning wartime account of human endurance and adventure, and an exploration of just how much the human body and mind can take, Sultana: Surviving the Civil War follows several young Union soldiers through the Civil War and then its unimaginably disastrous aftermath. Their enlistment, battle, trauma, prison camp, and, finally, the sinking of the Sultana, the steamboat that was taking them back home. Alan Huffman is a freelance journalist and the author has appeared on numerous National Public Radio shows and has contributed to many publications, including Smithsonian magazine, the Los Angeles Times, the New York Times, and the Washington Post Magazine. He lives in Bolton, Mississippi. CWL: An article in North and South Magazine set forth the cause of the Sultana's boilers to be Confederate sabotage with explosives hidden in coal. See "The Sultana: A Case For sabotage" North and South Magazine, 5:1. Alan Huffman's homepage has a Sultana photo album. 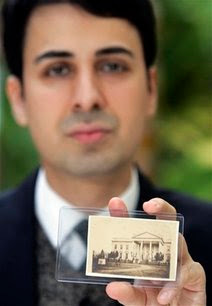 Collector: Lincoln Photo Uncovered In Grant Album, Brett Zongker, Associated Press, March 10, 2009. Grant's 38-year-old great-great-grandson, Ulysses S. Grant VI, had seen the picture before, but didn't examine it closely until late January. A tall figure in the distance caught his eye, although the man's facial features are obscured. He called Keya Morgan, a New York-based photography collector and Lincoln aficionado, who helped identify it as Lincoln. "I was like, 'I don't know who this is, Keya,'" said Grant, a Springfield, Mo., construction business owner. Although authenticating the 2 1/2-by-3 1/2-inch photo beyond a shadow of a doubt could be difficult, several historians who looked at it said the evidence supporting Morgan's claim is compelling and believable. Morgan talked Grant into taking the photo out of the album and examining it for clues, such as the identity of the photographer. "Not knowing who the photographer is is like not knowing who your mother or father is," Morgan told Grant. Grant carefully removed it and was shocked to see the handwritten inscription on the back: "Lincoln in front of the White House." Grant believes his great-grandfather, Jesse Grant, the general's youngest son, wrote the inscription. Also included was the date 1865, the seal of photographer Henry F. Warren, and a government tax stamp that was issued for such photos to help the Civil War effort between 1864 and 1866. Morgan recalled the well-documented story of Warren's trip to Washington to photograph Lincoln after his second inauguration in March 1865. Lincoln was killed in April, so the photo could be the last one taken of him. Warren, a commercial photographer from Massachusetts, enticed Lincoln into his frame shortly after the inauguration by taking pictures of young Tad Lincoln and asking the boy to bring his father along for a pose, according to the book, "Lincoln in Photographs: An Album of Every Known Pose," by Charles Hamilton and Lloyd Ostendorf. "This is the first act of paparazzi ever toward a president," Morgan said. "Lincoln is not too happy at all." Historians say it has been decades since a newfound Lincoln image was fully authenticated. And in the Grant photo, it's not obvious to the naked eye who is standing in front of the executive mansion. You can see the White House, a short gate that once lined the building, and, on the lawn, a Thomas Jefferson statue that was later replaced with a fountain. Five people can be seen standing in front of the building. The tall man's face is obscured, but zooming in on the image with a computer reveals a telling beard. "Once you scan it and blow it up, you can see the whole scenario — there's a giant standing near the White House," Morgan said. At 6-foot-4, Lincoln was the tallest U.S. president. Morgan, who has sold photographs of Lincoln and other historical figures to the Smithsonian Institution, the White House and others, said he purchased the image from Grant for $50,000 in February. It will be added to Morgan's $25 million collection of Lincoln artifacts and original images. Several historians say Morgan has a good case. Will Stapp, who was the founding curator of the National Portrait Gallery's photographs department and who now appraises fine art and photographs, said he's usually cynical about such claims. But he said he was "very satisfied that it's Lincoln" in the picture. "It looks to me like Lincoln's physique," he said. "I can see his hairline. I can see the shadow of his beard." White House curator William Allman said the photo appears to include Lincoln. "I guess there's always an element of doubt," he said. "It feels pretty likely, though." Even if it's not Lincoln, it would be among the oldest photographs of the White House. Lincoln artifacts have recently been hot commodities leading up to the 200th anniversary of his birth, and President Barack Obama has evoked his memory several times for his work to unify the nation. The significance of the photo is difficult to judge, Stapp said. It does show the relative freedom Lincoln had compared with presidents today, and offers a unique view of the White House from the 1860s, he said. "We don't so much think of (Lincoln) as living at the White House," Stapp said. "In that respect, I think it's an important find." 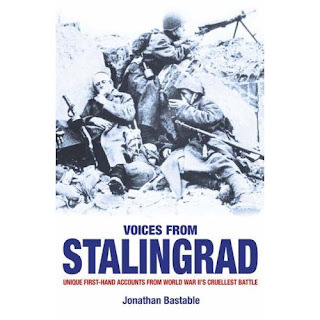 Voices from Stalingrad: Unique First-Hand Accounts from World War II's Cruellest Battle, Jonathan Bastable, David and Charles Publishing, subject index, contributors index, chronology, glossary, illustrations, maps, 304 pp., 2006, $24.99. If CWL had to rank the earth's battles in order of ferocity and casualties, Stalingrad would be among the top three. The Siege of Stalingrad is among the very bloodiest battles in all of history. Combined casualties are estimated to be above 1.5 million. Brutality toward military causalities and disregard toward civilian casualties was a characteristic of both sides. The Nazi offensive against the Soviets began in June 1941; in June of 1942 the German offensive to take Stalingrad began. The campaign lasted from June 28 1942 to February 2 1943. The battle toward the city, then inside the city, and the Soviet counter-offensive which trapped and destroyed and captured remnants of the German 6th Army with European auxiliaries was the first large-scale German defeat of World War II. Jonathan Bastable's Voices from Stalingrad is a compelling work. The campaign' history told by the battlefront soldiers is difficult to put down. On nearly every page, Bastable offers several paragraphs of a direct quote from a soldier, prisoner, and casualty. He tightly brings the words of the soldiers together with a chronological narrative, photographs and maps. His own text is never extraneous to the voices of the soldiers but firmly and succinctly builds the context for the soldiers narratives. A Soviet rifleman brings down a plan that is 300meters overhead. German soldiers die at night from no obvious cause; autopsies reveal that 20 year olds had the hearts of 80 old men, such was the starvation and fatigue of the armies. Rats are rampant and gnaw on corpses; horse meat is the only meat for soldiers. The war on the Volga River is treacherous: snipers, ice flows, and artillery interrupt Russian support to the beleaguered city in which cannibalism is not unheard of. From house to house, factory to factory, and street to street, Bastable offers a chorus of voices that describe a 200 day battle in which the distance between life and death is the distance which can be covered by the toss of a hand grenade. Frassanito: Battlefield Photography Then & Now, Greystone Communications Group, VHS, 60 minutes, 2001. Nearly all look back to the History Channels' Civil War programming with fondness for Greystone Communications efforts. Those who travelled to Gettysburg in the late 90s and until about 2005 usually made a stop at Greystone's American History Store at the intersection of Steinwehr Avenue and Baltimore Pike. Did CWL buy Gettysburg Magazine anywhere else? Probably not, it was always discounted 10% at the store. As a matter of fact, the December the store went out of business, CWL was in town for a whole week on a honeymoon. With books and media ranging from 50% to 80% off the retail price, s couple of shopping bags of books went home. Fortunately, the American History Story quickly reopened under new management and currently, with the near demise of the Farnesworth House's bookstore this winter, the AHS is among the best bookstores in Gettysburg. Greystone's The Unknown Civil War series included Frassanito: Battlefield Photography Then & Now. Narrated by Stephen Lang, who was cast as George Pickett and Stonewall Jackson in Ron Maxwell's films, the film summarized William Frassanito's groundbreaking detective work on 1863 photography at Gettysburg. The publication of William Frassanito’s Gettysburg: A Journey in Time began a new field in Gettysburg studies. Approaching post-battle photographs as historical documents, he found many to be misidentified and misunderstood. Frassanito toured the battlefield with Brady’s, Gardner’s and Tipton’s photographs in hand. He struggled with the changed tree lines and missing fences. Key to Frassanito’s discovery were the unique shapes of rocks and boulders. He found that published pictures were mislabeled as being on the July 1 field when in fact their setting was the July 2 field. The settings were on the Rose Farm, which had been absent from battlefield studies, now came to the forefront. Frassanito focused on the positions of arms and legs and realized that the bodies were photographed from different angles. Furthermore, he reinterpreted the famous Devils Den sharpshooter photograph and concluded the body had been carried to the spot and equipment added. CWL surveyed Glen Tucker's 1958 High Tide at Gettysburg and Edwin Coddington's 1968 Gettysburg: A Study in Command and found that indeed that prior to Frassanito's work, the Bushman/Rose/Slyder farms' actions did indeed get short discussions.